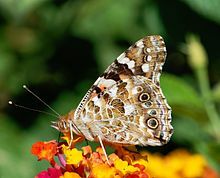 Starting April 14- September 2, 2013, for the 15th year, 53 different species of butterflies will be inhabiting the Natural History Museum of Los Angeles at the Butterfly Pavilion! 20 of them alone are from our native state of California. Additional to the beautiful butterflies, the gardeners of the Natural History Museum have incorporated native plants to provide the life giving nectar to our native butterflies. This helps tell the story of the wild butterflies and how we can help them survive in their native habitats. California Dogface- munches on the foliage of the Desert False Indigo is our State Butterfly. 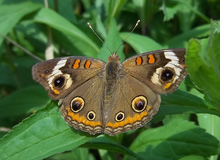 Buckeye Butterfly- drinks the nectar of the Lilac Verbena flowers. The Pavilion is more than a beautiful place to come look at butterflies, it is also a teaching tool. You can learn about the migration, defense mechanisms, and plant interactions of the its winged inhabitants. The Museums goal is to share the whole life cycle. 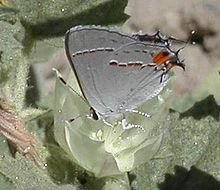 All stages are shown from egg to caterpillar to butterfly thanks to the host plants. There are plenty of Butterfly experts to answer any questions about the metamorphosis, butterfly anatomy, and breeding habits. Other things that help attract them seem to be; hats, tall people, and standing still. Come when the Pavilion opens between 10-11AM before they get too much sun. They are more active. Additional to the Butterfly Pavilion, the museum has planted a 3 1/2 acres of butterfly friendly gardens that open to the public June 9, 2013. These gardens provide the perfect habitat for certain butterflies that breed well in the wild naturally in the surrounding areas of the Museum. 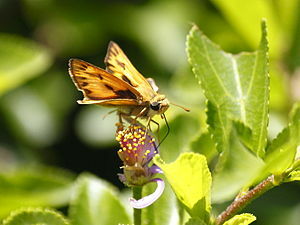 Some of these include, Fiery Skipper(Hylephila phyleus) that lays its eggs on some of the new grasses and the Gray Hairstreak(Strymon melinus) which lays its eggs on the newly planted buckwheat. It is in these gardens that adults and children alike learn how to plant their own Butterfly Gardens in their own backyards and school yards while learning about water conservation and edible gardening. They will also learn about "good bugs" and "bad bugs", which you want to stay in your gardens and which you need to get rid of. At the indoor science hub, Nature Lab that opens on June 9, 2013, there will be the the Museum's Citizen Science initiatives. The Butterfly Survey is a project in partnership with Butterflies and Moths of North America(BAMONA) that aims to extend the Museum's Butterfly experience beyond the beyond the outdoor exhibits and into the community. For more information on NHM’s roster of citizen science projects, visit www.nhm.org/citizen science. Please call (213) 763-ED4U or e-mail educate@nhm.org for more information. $6; Museum members and children under 2 are free. Museum Members and children age 2 and under are admitted for free. Greatest bug chefs in the world! Some objects are 4.5 billion years old! The NHM's landmark exhibition on the cultural and environmental history of Los Angeles, opens July 14, 2013. NHM is at 900 Exposition Blvd., Los Angeles, CA 90007 and is open seven days a week 9:30 a.m.-5 p.m. For more information, visit the Museum’s website at www.nhm.org or call (213) 763-DINO. Those are some beautiful butterflies. We have a butterfly bush in our backyard that have several different types of butterflies. Awesome! I should plant one! LOve butterflies - they are so pretty. That is so pretty! 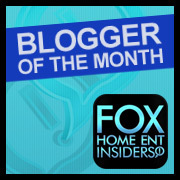 !Thank you for sharing! Your welcome. :-) we have Monarch Butterflies where I'm at. I love going to butterfly exhibits. Thanks so much for sharing this info. I hope our zoo does something like this soon. Very pretty! This sounds like a wonderful exhibit! I wish I was in LA to visit the Natural History Museum!